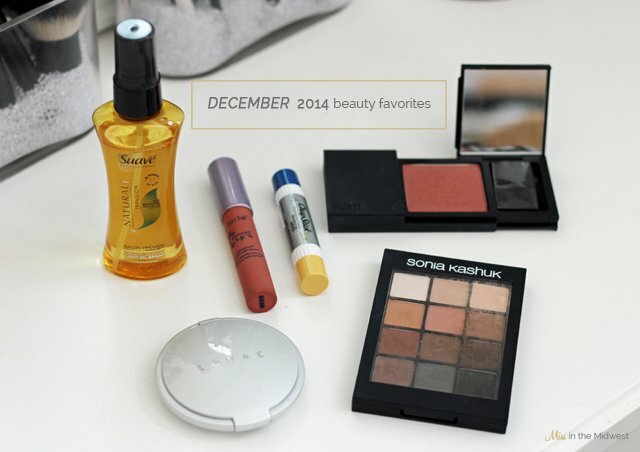 It’s time for the first round of monthly beauty favorites of 2015! I’m considering still doing a best of beauty 2014 post, but for now, I’m focusing on the few items that got me through the crazy month of December. Between moving, lots of traveling and the holidays, I solely relied on these few items to keep my hair, skin and makeup in good shape. Suave Natural Infusion Moisturizing Light Oil Spray // Since my hair tends to get oily, I always have stayed away from oil sprays; however, when Real Simple Magazine recommended this product in one of their recent issues, I took the plunge. I simply spray a few pumps onto my damp hair, roll my hair up in a towel while I’m getting ready, and then I blow dry. I’m left with shiny, silky strands. It also smells like heaven. ChapStick Hydration Lock // Another recommendation from Real Simple Magazine, I love this lip balm because the yellow side has an SPF for daytime, and the blue side is to moisturize your lips before bed. I’ve mostly been using this at nighttime, and I wake up with a smooth, hydrated pout. Flirt! Peek-a-Blush Sheer Powder Cheek Color in Caramel Belle // Since this cosmetic line is sold exclusively at Kohl’s, I don’t think it gets the recognition that it quite often deserves! Flirt! is owned and produced by Estee Lauder, so the products are the same high-end quality but for a lower price point. I’ve been loving this particular color to help warm up my face a bit in the cold – it’s a brownish, pink shade with just a slight hint of shimmer. LORAC Perfectly Lit Oil-Free Luminizing Powder in Spotlight // I would consider this to be the perfect, most universally-flattering shade of highlight for any woman. It’s subtle but packs a strong punch of sheen to give the skin an almost angelic glow. I wore this to every holiday event that Ryan and I attended last month for an extra bit of holiday shimmer. I couldn’t find the link to this product anywhere, which worries me that it’s now discontinued … anybody else aware of this? Sonia Kashuk Eye on Neutral Matte Palette // As I was working out of my cosmetic bag for a few weeks with moving and getting unpacked, I kept this palette handy since it offers a whole lot more neutral, matte shades than the Naked Basics palette, but it is still compact enough to travel with. It’s hard to find quality matte eyeshadows from the drugstore, but as always, Sonia Kashuk succeeds with this one. Tarte LipSurgence Natural Matte Lip Tint in Exposed // Tarte’s Amazonian Clay blush in Exposed is my holy grail of all blushes, so it’s no surprise that I also love this matte lip tint in the same shade. It’s a good neutral shade with just the hint of a dark pink undertone. Also, don’t let the word matte scare you away; the formula is rather creamy and hydrating on the lips. What products were you loving throughout December? I'll definitely try that Chapstick. I went to the gym this morning and ooh the wind.. Gotta love Chicago!!! Brr. I also have to work today and will be wearing the long underwear that my mom gave me. Anything to stay warm! Please feel free to stop by my blog some time too. I adjusted some settings on here, and wasn't sure if you were able to get to it. 🙂 Have a great day too and stay warm!!! Yes! That's where I bought both of mine. Thank goodness for employee discount. Just like the blush, the Exposed lip product is pretty much a universally-flattering color! I imagine it would look good on anybody and everybody. My hair is very similar! Since I highlight my hair and most recently nearly had my ends bleached, my ends have been drying out a lot quicker than normal. I've had no problems with the oil spray so far, but I'll update you if that changes! My skin has been extra dull and lifeless lately, so I've heavily been relying on highlighters to make me look a bit more awake and life-like. The LORAC one is so great, I sure hope it's not discontinued! Both are fantastic products! Thanks for hosting the linkup – happy New Year! You seriously cannot go wrong with anything from Tarte in the Exposed shade. Those lip crayons have such a great formula, too. Girl, Real Simple Magazine is my go-to for everything – it's the only magazine that I subscribe to! The Sonia palette is such a great drugstore find! The ChapStick product was new to me, too, but it was another great recommendation/find. The ChapStick is a fantastic product – Real Simple rarely leads me astray when it comes to beauty recommendations. 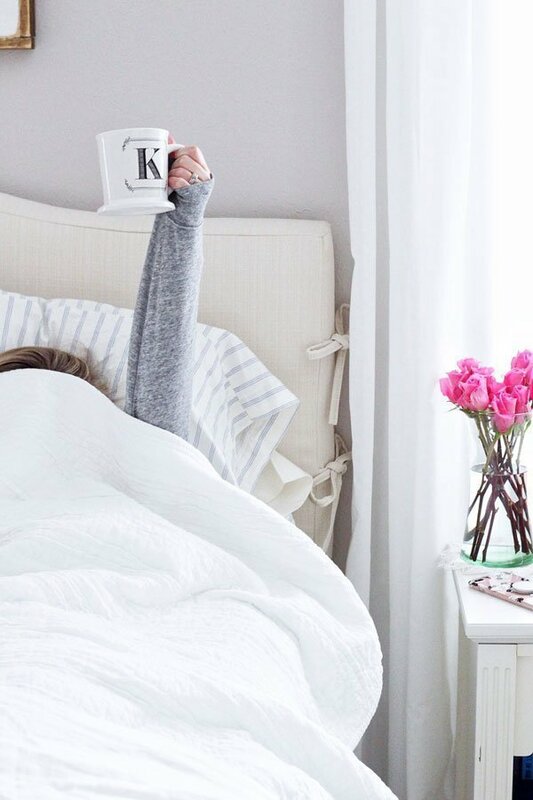 Hope you're staying warm! Lol! I highly doubt that, but I know the struggle is real there. I used to have the same issue until I figured out how to properly apply it. It's a good one – it would look good on your skin tone! I've had that Tarte lip product for a long time, but I sometimes forget about it – glad I came back to it this month! The Flirt products are really great – I've also used their eye shadows. I think you'll enjoy the Sonia Kashuk palette! It's really one of the best ones at the drugstore. Girl, you will love that lip balm! It's perfect for what you're looking for. I can't wait to try both the Chapstick and the Suave spray! Now I have 2 more things to add to my list when I go to Walgreens tomorrow! I've been wanting that eyeshadow for a while now. I think your great review means I need to break down and buy it!! I've been seeing those Tarte matte lip tints all over recently, I'm definitely curious about them now! I bet Exposed would be the perfect shade! That blush looks like such a gorgeous color and I haven't heard of that luminizer, but it sounds amazing- so perfect for this time of the year when my skin is feeling extra dull! Love the Sonia Kashuk palette! That chapstick hydration lock sounds intriguing! 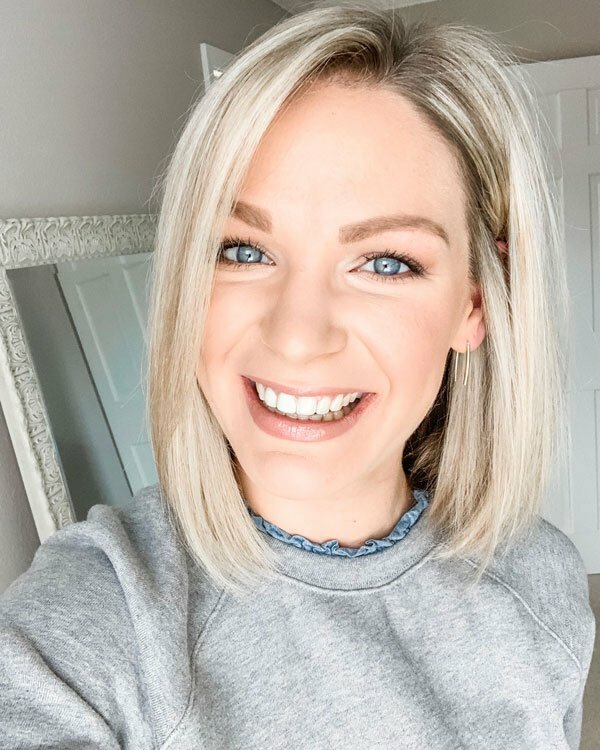 Thanks for linking up, Karly! Definitely trying the Tarte lip product because I'm 1) obsessed with the Exposed blush and 2) loving my other Tarte lip crayon! Also, isn't Real Simple the best magazine ever? It's the only one I buy regularly! Thanks for the reviews! chapstick and light oil spray for the win! Great reviews! I haven't heard of the ChapStick hydration lock before! That sounds awesome! Really like that Sonia palette too. Really great colors! Ooh love that eye shadow palette! That lip tint sounds nice too. I saw that Chapstick at Walgreens and was curious about it. I feel like my entire person gets dry during the winter, so maybe I'll try that stuff. Hope that you're having a good day so far too! I wish I was better at applying eyeshadow. I always look like I got punched in the eye when I apply it! I'm liking that blush from Flirt at Kohls! I didn't know that Flirt was done by Estee Lauder, I'm going to have to look a little closer at those products next time I go to Kohls! That highlighter sounds great so I hope it's not discontinued so I can give it a try. I have wanted to try that Tarte lip product but haven't gotten around to it yet, now I will have to based on your review! I am definitely getting that eye palette. I wanted to try some different ones, but am not ready to shell out the money for the naked palettes, so this is perfect. Thanks for sharing girl! I also love the tarte blushes, so I'm going to have to try the lip tint too!